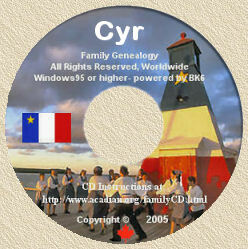 Acadian Genealogy Homepage; Acadian Memoirs of Alice Michaud CYR (#2)! One special room on the first floor of a home, was called "La Grande Chambre" and in there "La Croix de Tempérence", hung on the wall. Family albums had precious photos of ancestors, a crucifix (which was usually the one put in the casket of a dear one), was in that room. In checking the records at St. Bruno's (Van Buren, Maine), I came across the names of the first who signed the pledge, or as they said, "Prendre la Tempérance". The first name on the list, is my great grandfather Christophe CYR, followed by the names of two grand uncles, Dennis Farrell and Michael Farrell. Many familiar names are on this list and it is dated February 27, 1842. This "Grande Chambre" was also the place to receive "Monsieur le Cure", when he made his yearly visit ("la quète de l'Enfant Jésus"), or when one was very ill, or the parents had to talk to their pastor. This room saw many sad events. The dead were put in this room, including small babies who died. And sometimes a distant relative would come home to die, as this was the quietest room of the house. In many homes after supper, the oilcloth covering the table was wiped and turned on the other side on which was a design, something like Parchesi and was called "Jouer au Ciel". And of course "le Jeu de Dames" was very popular, as well as "Le Conteur de Contres"! A man came once or twice a year, who knew all the best yarns and stories that had ever been told. Many a night, children would fall asleep near the stove, listening to all those stories about giants, fairies and many that would have made Mother Goose, seem tame. A popular outdoor game, was baseball. Mothers used to roll some tight yarn into a nice ball and then cut some old leather shoes and cover this ball, which looked better than store-bought ones. Bats were made by the grandfathers. The game of horseshoes, was much in demand and young and old alike, played it. Visiting around the neighbours and exchanging recipes was a great sport, especially when a visitor from "Les États" (United States) was home for a stretch; usually someone from Salem Mass., was the guest. Not many people, aside from farmers, knew about maple sugar time. My grandpère would start early during Lent, to get out his big iron "chaudrons" from the storage shed. The week after closing the camp, "grandpère" Francis "Croc" CYR would clean up all he needed, if there were any bark left, or even a dew "casseaux d'écorce"; he would pack all and take this to our town-farm, as the maples were not on the town-farm but "dans les concessions", some four miles from home. It was so much fun to run around the trees, to collect sap and then stay overnight and watch the different changes in the "grand chaudron". As soon as there was enough heavy syrup made, we would make a small fire and then put some syrup in a pot on the fire. Then we'd break an egg in the syrup...what delicacies! Then came the pouring of the candy..."de la tire d'érable"...on clean snow. And for me, this is about the sweetest and best treat we kids ever made! My "grandpère" Michaud, who lived on the CYR Plantation, always carved some lovely containers for the maple sugar; little books, hearts, stars, diamond shapes etc. We would keep this to give or send to out-of-State relatives, or send to relatives of friends who, unlike us, never went to a sugar camp. While running around in the maple grove, we had a task to do. "Grandpère" was already thinking of spring cleaning and spring medicines. We had to gather seven kinds of wood, to make a tonic. To this day (1960), I remember many of them. Of course the regular molasses-sulpher treatment, came even without asking for it. This was supposed to clean up the whole body. . I can still see in the pantry or in the attic, bunches of herbs of all kinds, hanging head down, mostly tied in a paper bag, from the ceiling or on cords like a real washing. During Lent we really fasted, even if we were children, as our mothers would not make too many cakes or other sweets. We ate hardly any meats and all kinds of vegetables which were, at the time, usually salted, as were many kinds of meat, especially deer. Fowl was coated with ice and then put in wooden boxes, in the ice part of the pantry and shed. Many cut their own ice from the lakes and had a compartment in the large shed. This was filled with sawdust, therefore being nice and cool in the summer and a nice freezing place in winter. What a contrast between 1900 and 1970 in the food that people now eat. They now have to take vitamins to make up for what they lack in nutrition. We had three meals a day and a few extra lunches in between the meals. Breakfast was like the other two meals, dinner and supper..."plogues" with a nice gravy or milk sauce with onions in it, eaten with pigs feet and headcheese, which was like "corton", usually with pan-fried or mashed potatoes. We had so many ways of cooking potatoes, and of course, there was home-baked bread or biscuits called "des biscuits au soda" or, "crème de tarts". Milk was given to the children, and usually grown-ups had a glass of milk near their plate. Barley and wheat was toasted in the oven, or sometimes on the stove lids, then made into a lovely coffee. Children would have half-and-half of this lovely beverage. This was one of the great events of the year! Many families, too shy to go and see the Pastor when they were in need of help (material as well as spiritual), waited for this occasion to unload their burdens and, many times, ask for guidance with their family. Sometimes a starry son or daughter, a husband who drank too much, and often the mother was the one who needed this help, so that when the Pastor came in, everyone would kneel and ask for "la bénédiction" (blessing). In winter, there were always two carriages, oftimes a long sleigh, to bring back "la dimes" at the time, paid in products of the farm. "Le Bédeau" drove the first horse team, ringing the bell sometimes when there was a storm or fog. The Pastor had announced in the church the week before, that he and his two aides would have dinner at the end of the CYR Plantation, which meant usually at the home of Andre CYR, or some of his children. This road was "le chemin de Caribou". Other roads were "le chemin des Madores" or "jusqu'au Ruisseaux des Ecureux", etc. At night the sleigh, driven by "le bédeau", was usually packed with meat, poultry, sometimes a nice home-made carpet, or hand-woven linen. Those were the days when neighbours knew his next-door neighbour and was there, when needed, so that all these reunions were made up of one large family, including neighbours. "ONT PORTE LE BON DIEU"
When a person was in danger of dying, someone would get the priest and he would come at once to the one who needed him, and also "le bédeau" or someone who came with the member asking for a priest, headed the cortege and rang the bell. The church bell also rang and one counted the tolls...so many for a woman and so many for a man. When the carriage went by, everyone went out and knelt while the Priest was going by. In winter, one opened the door and knelt. In summer, even people on the sidewalk would kneel. The Faith of our ancestors is something we should remember, and also, speak about to our children. Children had been taught to help in any way possible, and many saved their pennies for the visit of a Priest, so they could give "pour le Petit Jésus". "Les Rogations" was a special day, which meant that farmers and others, would gather money, "pour les biens de la terre". This was to have Masses said. Money was collected among themselves, or a family would give, in the name of all children. Also, bowls of grain, etc. were brought to the church. A special Mass was said, and the grain was blest and then planted with the crop of different kinds of grain, to insure a good harvest in the Fall. Who among the farmers did not have a sugar camp? Not many, as this was part of the sweets for the year, and many who did not have any left for the next sugar time, borrowed some. My granddads used to go to Houlton (Maine) with their horse and buggy and buy 100 pounds of white sugar, and also some unbleached cotton, to make sheets, underwear, etc. They would bleach this on the snow in winter, thus having it real white when summer came and when the children needed new clothes. Click here to returnto Page 1 of "Mémère Michaud/Cyr Memoirs".